I’ve often thought that having an emergency fund is the most basic component of good financial planning. Everything else you do with your finances is based on this simple, single building block. You can have money coming in, money going out, and even a healthy reserve for your golden years. But if you don’t have money set aside somewhere, just to have available in case of an emergency, then your finances will never feel quite right. At a minimum, your emergency fund should hold at least enough money to cover 30 days of living expenses. More is even better but this is an excellent starting point. How do you get an emergency fund started especially if you’ve never had one? 1. Hold a garage sale! I don’t mean that you need to literally have a garage sale – okay, I actually kind of do – but the bigger picture is it’s time to start selling some things that you really don’t need. There is money sitting in a lot of the stuff you have around your house and it would look a lot better filling up a bank account rather than a storage room. A garage sale is one of the fastest ways to sell your stuff to raise cash. You can probably earn a few hundred dollars from a single garage sale. That’s not much, but if you have no emergency fund now, a few hundred dollars is a solid start. But don’t stop at a garage sale. Look into selling a car that you no longer need, recreational equipment, or even furniture and jewelry. Anything that you haven’t used much in the past year should be fair game for sale. And any money that you receive as a result of selling them should immediately go into your emergency fund. You can try to sell your items in your neighborhood newspaper, on Craigslist, eBay, Amazon, the or on the pinup board work, church, or in your local grocery store. 2. Have any windfalls coming in? Bank em! Every now and again, some extra money comes in a cash windfall. Don’t spend it, bank it. It could come in the form of an income tax refund, a bonus at work, the sale of a small investment position, or even a rebate on a major purchase. Money from any source such as these should go immediately into your emergency fund. One of the advantages to using this money for your emergency fund rather than some other purpose, is that it quickly and easily fills the fund. If you are not a saver by nature and have never had an emergency fund, quick results will be the key to building a sufficient account. Windfalls are the best way to do this. You can put money into your emergency fund without causing any stress on your budget. 3. Cut some expenses you don’t really need. Make it a point to go through your checkbook and your credit card statements for the past six months or so to see if there are any expenses you pay for services that you don’t truly need. Make a list of these expenses, see how much you can save by eliminating some, and consider getting rid of as many as you can live without. For example if you really don’t watch much TV, there’s no point paying for 200 channels through your cable service. You may also notice a pattern that you’re spending a considerable amount of money on eating meals outside the house. Could you reduce your restaurant meals from 10 a month to just five? These are just some examples of relatively small expenses that you can cut that, taken together, will allow you to bank at least some money every month. Even if you “only” locate $200 per month in savings, putting that into your emergency fund each and every month for a year will give you $2,400. Now add that to the money you collect from selling your stuff and from windfalls that you receive. It starts to look credible, doesn’t it? 4. Pick a percentage of your income and bank it – every pay period. Once you find ways to save money in your budget, you’ll need to develop a foolproof method of getting the money into your emergency fund account. The best way to do this is to allocate some of your paycheck toward a direct deposit into your emergency fund. In that way the money will go into the bank and you won’t even notice it’s happening. Not only will it be simple, but it will also remove the temptation to spend it before it gets to where it should be going. You can do this by allocating a percentage of your paycheck that roughly matches the amount of money that you’re saving from the expenses you no longer have. That will make the shift virtually pain free because it won’t feel like you’re giving anything up. As a final recommendation on your emergency fund account, it will probably be best if the account does not contain check writing privileges or access via a debit card. You want to be able to get your emergency fund money in the event of an true emergency, but you don’t want to make it so easy that you’ll be tapping it for situations of lesser importance. What methods have you used that have enabled you to build up an emergency fund quickly? Leave a comment! This article was originally published November 19th, 2012. Am nowhere near putting together a functional e-fund as I would want to be. I seem to double back a lot on my efforts. I’d certainly benefit from having a consistent figure am banking every pay period. At least thats something I can commit to. That and having a strict time line as to when I should have a functional e-fund. Hi Simon – That’s part of the problem with building an emergency fund, that expenses keep coming up while you’re building it. Even once you have the fund up and running you have to keep filling it because there will always be emergencies. I think you pretty much would have to do all of them. Thats the only way to build the amount you need. Good overview. Like you, I am obsessed with personal finance; its just in my blood. Your story of turning a desire for a video game into savings really strikes a cord with me. Emotions and incentives are just so powerful. Using them to help you save is the key. Some very cool sites are trying to help people do just that. smarty pig (savings/spending incentives), impulse save (save don’t spend) and getsavi (prize linked savings) are trying to help everyone make savings an important goal in their lives. However you do it, get that emergency fund. There is no freedom quite like financial freedom. Having an emergency fund as really changed our lives for the better. If we haven’t been able to save for something by the time it breaks down (i.e. our hot water heater), then we have the peace to know we can still cover the cost without having to go into debt. Hi Jaaon–I’ve heard an emergency fund described as “sleeping money”–money that allows you to sleep soundly at night free from the worry that a single unexpected expense can send you into a panic. If it does nothing more, it will have done it’s job. I travel a bit for work and I’m reimbursed for my travel. I calculate what I would have spent (food, gas, etc.) had I not been traveling and add it to my bottom line for an emergency fund in addition to the money I set aside every month. Wow Brad, that’s an innovative way to save! It’s an excellent way to increase or replenish the fund which is completely necessary because costs and living expenses tend to rise with time. 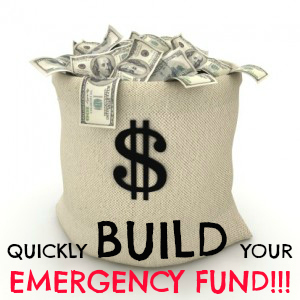 Your emergency fund needs to grow in response.